GE JES1097SMSS is a smart and modern, 2018 release best selling countertop style microwave oven that is certified to work with Alexa and Echo Dot. It has a 900-watt power motor (120V), a 0.9 cubic feet capacity, and a smart sensor along with a scan-to-cook technology. 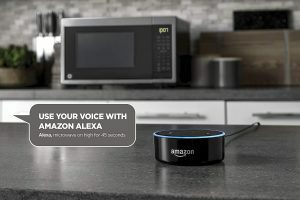 If you hook up the Echo Dot to the microwave you can control the unit with easy commands, like cooking on low for 90 seconds, or making pizza by asking Alexa. The Echo Dot functionality is offered with a 40-dollar price difference at the time of this review. If you choose the one without Echo Dot, you can still get it to work with certain Alexa devices that you can purchase separately. You need to follow the easy step-by-step instructions on the product page or instructions manual when connecting Alexa. You can give simple voice prompts to defrost, heat or cook with the Wi-Fi Connect and Alexa. With the Scan-to-cook technology and scanning the barcode on the GE appliances app, the GE microwave is programmed for the right time and power settings. And the frozen ingredients will be defrosted the way the should be, just like the manufacturer wants you to. You’ll find 7 convenient pre-programmed sensor menu for pizza, potato, veggies, reheat, dinner plate, popcorn and beverage. It has a .9 cubic feet capacity with a 10.5-inch diameter glass turntable and the interior measures 13.7 x 8.7 x 12.4 inches. 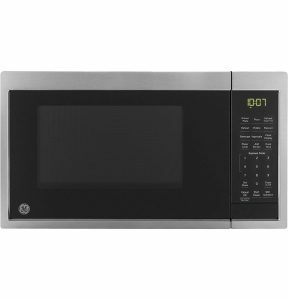 The GE Smart Microwave weighs 28 pounds and its stainless steel exterior is 11.5 x 19 x 14.5 inches. You have ten power settings for different types of items on the 900-watt power unit. You’ll also find a kitchen timer and a clock on the LED-backlit electronic digital display. There is an interior LED light for you to see the cooking process clearly and a child security lock to protect your kids. To be able to use the smart functions of this microwave you need to download the GE Kitchen app from Google Play Store or iOS. With the Add Time option you can extend the cooking time and you don’t need to push a button for that. It weighs 34.1 pounds and measures 17.2 x 21.1 x 13 inches. If you wish to get a larger model, GE offers those models but without the Scan-To-Cook or Wi-Fi. The exterior is stainless steel and both the exterior and interior are easy to clean with a damp cloth. The numbers and the settings are close to each other on the control panel and you may select the wrong setting by mistake if you have large fingers or are visually impaired. It doesn’t work with Google Home Mini at the moment but with Alexa. It is quite straightforward to set up the Alexa thing but may take a little time to get used to by the not so technically savvy people. Alexa can be a little picky about how you pronounce the words. But once you get it to work everything will be very easy and you’ll get on just fine with Alexa. Overall it offers pretty good value.